Crowded with stalls and customers a welcome refuge from the weather! The wet and windy weather last Saturday, December 1, helped make St Mary’s Church Christmas Fair even more popular as a refuge from the rain with its welcoming atmosphere of festive fun. The heavens opened along with strong gusts of wind so everyone arrived rain soaked and gratefully heading for the refreshments. The whole church was packed full of stalls and the event clearly was a feat of organisation led by Chris Emson and her army of volunteers and helpers. 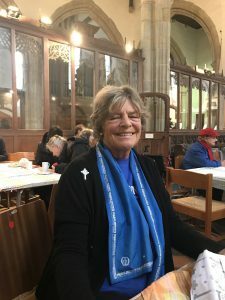 There was a knitters’ group raffle, tombola, bric-a-brac stalls, books, and water colours of Crete by Barbara Lloyd in addition to all the delicious home-made cakes and hot drinks served throughout the day. Recordings of traditional Christmas carols accompanied the many attractions of the 29 stalls representing the Churches Together favourite charities including the WI, Mothers Union, Cafod along with local businesses and the Rye Museum. The Hope and Anchor Hotel had brought along their tables laden with a fabulous range of cakes the proceeds of which were kindly donated to St Mary’s fund. Chris expressed grateful thanks to all the volunteers and cake bakers. The fete was clearly a complete success with lots of funds raised for charities and most items going home with new owners by the end of the afternoon.